Dev Bhatia: SRCH2 is next generation search software, built from the ground up. It's all new, from scratch, and not tied to some of the legacy devices that have been around for more than a decade. Those devices worked great, but unfortunately, they're juts not up to speed on the newer innovations in big data and the technology world. SRCH2 is set to change that, and is built to address those needs. A few examples of what we've done, is we do instant search. Most consumers know how this works if they use Google, which launched this two years ago. That means, we search as you type. Every type you type, it generates a whole new set of things that you might be interested in. That allows you to get to where you want to go, faster, and so you're more likely to find stuff, super fast. On top of that, we do error correction. If you make a mistake typing into the search box, we still take you where you want to go, and recommend the right place based on an index. We're able to do that in cache, in memory, blazing fast. When I say blazing fast, that means 31 times faster than the industry standard. Consumers have been trained by Google on instant search, and see the value of it, because we all know that instant search gets us where we want to go, faster. It increases the utility of search. But, it can only be used in certain places, such as Google itself. It's pretty hard to imagine instant search in other context, and on other devices, particularly when it comes to mobile. There are unique problems with mobile, including memory issues, network latency, and typing issues. You make more typos on your phone. We have new search software which takes that into account, and does things like geo-searches as well, and really makes it something of value in the modern context. Who are the customers for your technology? 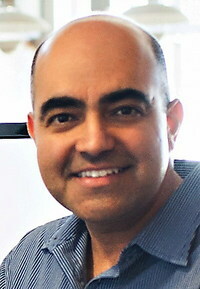 Dev Bhatia: You can think of them as lots of different platforms and devices. It's mobile and mobile apps, but not just mobile apps. It's also the hardware, and we'll soon be putting out announcement that we can talk about, deploying our technology on handsets and other devices. It's not just mobile, it's also e-commerce. With e-commerce, it's a whole separate value proposition. One of the unique benefits from the product context, is that as you type, you're able to find your product faster. The conversion rates go up, when e-commerce sites deploy instant search. Dev Bhatia: This is my fifth startup. I've been doing startups for awhile now, focused on data analytics, and customer relationship management, in the internet context. However, what is much more valuable is the experience of Chen Li, the founder, and his team. They're Stanford Ph.D's, who came out of Stanford in 2001, as part of a class of really clever data scientists. They all went on to start a whole bunch of big companies, and Chen was among those. They all shared a common advisor, Jeffrey Ullman, who is a world-renown data scientist. He's an advisor in the company, and also an investor and on the board. He's a world renown data expert, focused on data science, and two years ago with some other Ph.D.'s began coding what eventually became the product you see today. How did you connect with those guys? Dev Bhatia: We had a common interest. We had met about a year ago at an Irvine Chamber of Commerce event. It's really a Southern California story. I really saw something there that was attractive. Sometimes, when you have enterprise software, it's very hard to convey what it does, and get the word out in the consumer context. That's because we're all consumers, and we are used to understanding the consumer aspects of technology, but when you find technology that is not so easy to understand, it takes a while for it to soak in. Chen and his team were having difficulty getting people to understand how they were adding value. However, if you look at enterprise search, for every two years, over the last ten years, someone has disrupted the major enterprise search companies, by creating technology that become enormously valuable. You can look at companies like Endeca, and Autonomy, who created things which were enormously valuable. It's not that search didn't exist, they just added new value. The same is true here, we're taking the world forward a little bit in the world of search. Where are you in terms of working product? Dev Bhatia: It's live, and it's been live for awhile. We already have live, paying customers in several categories. We're on our version 2.07 release; our 2.0 release came out in September. What's needed to push this market forward? Dev Bhatia: The specific things that have been challenges for many companies are mostly on a roadmap for the big companies, but further down the road. If you look at any company and how they look at search, they're having to reimagine what search is. If you look at mobile, e-commerce, and GPS, there's a whole different set of issues they are seeing now. For example, geosearch in cache is most important now and extraordinarily valuable. There on certain things on people's roadmap we do already. They might be able to get there by spending time and resources for several months, but they'll still be 31 times slower. For us, they can deploy it out of the box, it doesn't require development time, they can figure it out in an afternoon and launch. Dev Bhatia: I think now, it's question of getting out there, and gaining traction. If you look at enterprise search, it's a wide open market. No one has heard of SRCH2 yet, so we're trying to get the word out so we can have a conversation with them on what we're doing next. There's already an existing demand, which was created by Google. Anyone who goes to Google knows what instant search is. But, if you go to any other search box, and try to use it and get the same utility out of it, you can't. What we're trying to do, is take advantage of that existing demand and get the word out about our product.